Seborrhoeic dermatitis is a chronic papulosquamous dermatosis characterised by scaling and poorly defined erythematous patches. This is due to increased sebum production (seborrhoea) in areas of scalp and follicle rich areas of face and trunk. 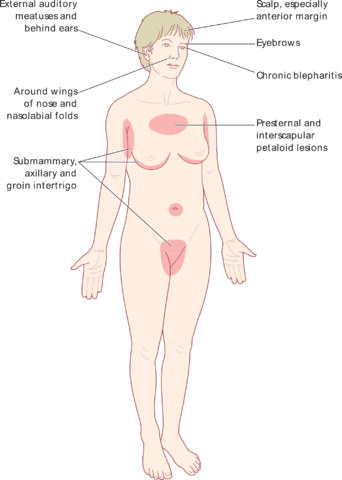 Seborrhoeic dermatitis is a common dermatological disorder in the United States. Three age-groups were identified by epidemiologists that show a peak in the incidence of seborrhoeic dermatitis. The first peak in the incidence of seborrhoeic dermatitis is seen in infants up to 3 months of age. The incidence of seborrhoeic dermatitis in this age group can be as high as 42%. The second peak in the incidence of the disease is observed in adolescents, while the third is observed in adults. The estimated incidence of seborrhoeic dermatitis in adolescents is around 3%, whereas, the incidence in the general adult population is around 1%. The male to female ratio of seborrhoeic dermatitis is 1.15 : 1. There appears to be an ethnic predilection with only few cases seen in African Americans; this claim has however been contended by other researchers supporting an unbiased ethnic predisposition. It is found to be commonly associated with patients having Parkinson’s disease or those under psychotropic drugs treatment like haloperidol. The exact pathophysiology behind seborrhoeic dermatitis remains unknown with a number of theories propounded. Here, we discuss the most popular ones. Unna and Subauraud first described this disease with an etiology based on bacteria, yeast or both. The theory did not receive much support in relation to Candida albicans, Staphylococcus, Propionibacterium but a strong correlation seems to exist between seborrhoeic dermatitis and a yeast called Malasseziafurfur. There are reasons to implicate this yeast in the causation of seborrhoeic dermatitis such as positive response to antifungal treatments and seborrhoeic-like lesions in animal models inoculated with this yeast. These yeasts are said to induce keratinocyte production of proinflammatory cytokines causing skin eruptions. The final metabolites are also thought to react with triglycerides from sebaceous glands leading to inflammatory changes. Seborrhoeic dermatitis is not a disease of the salivary gland nor can increased production of sebum be found in all patients. Seborrhoea, however, may be considered a predisposition owing to the high incidence of this disease in newborns with large sized and highly active sebaceous glands. In childhood, sebum production and seborrhoeic dermatitis correlate well. In adults, however, rates of sebum production are increased during puberty while the disease appears much later. The commonly affected sites – scalp, ear, face, and upper parts of the trunk that are rich in sebaceous follicles and glands. Nutritional deficiencies: zinc deficiency and biotin deficiency may mimic the condition but studies have found administration of zinc and biotin no more effective than placebo. Aberrant epidermal proliferation: similar to psoriasis, epidermal proliferation is increased. Physical factors: Cutaneous blood flow and skin temperature may be responsible for the distribution seen. Low temperatures and humidity in centrally heated rooms are known to worsen the condition. Seborrhoeic dermatitis is characterised by the development of pruritic, erythematous patches with easily detachable greasy large scales. Prominent follicular openings and mild to severe pityriasiform scales are seen. Complications include otitis externa and oppurtunistic infection with C. albicans , S. aureus. Petaloid: lesions form clearly outlined round to circinate patches. Pityriasiform: oval scaly lesions whose long axis is parallel to the ribs. Mimics pityriasis rosacea. Extensive involvement of different areas of the body that are not commonly involved such as the extremities. The degree of spread of the disease is negatively-correlated with CD4 counts. Meaning, a CD4 count less than 200 cells/mm3 can be associated with more widespread disease than a CD4 count more than 200 cells/mm3. It is commonly associated with rosacea, psoriasis, and acne. 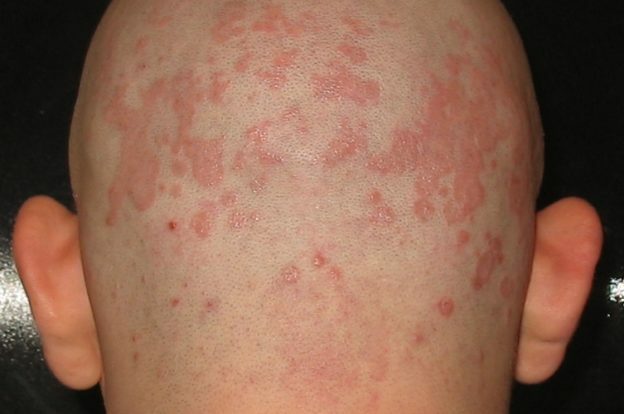 In adults with severe, atypical widespread or treatment resistant forms, seborrhoeic dermatitis acts as a cutaneous marker for the presence of HIV/AIDS. Thus, an ELISA test for antibodies may be done when CD4+ counts are between 200 and 500 cells/mm3. While the diagnosis is usually easily established on clinical grounds, a number of conditions may lead to some confusion. 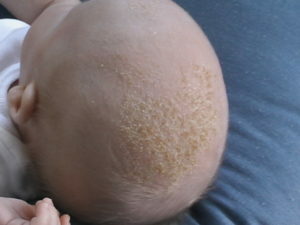 Tineacapitis: can be differentiated from seborrhoeic dermatitis of the scalp on examination. The superficial skin scraping prepared with potassium hydroxide are used to confirm the diagnosis. Wiskott-Aldrich syndrome: mimics seborrhoeic dermatitis in young patients but purpura and petechiae are additionally seen in the syndrome. In infants: Most common entity leading to confusion is atopic dermatitis followed by scabies and psoriasis. Langerhan’s cell histiocytosis must be ruled out before making a definitive diagnosis. In adults, the condition is usually chronic and therapy is directed at controlling the disease rather than curing it, while in infants the disease being benign and self-limited carries a good prognosis. Proper skin care with soft pastes, creams etc. Alcoholic solutions are not recommended. Low potency glucocorticoids based cream are treatment of choice. Otic preparations that contain neomycin should be avoided. If Demodex folliculorum mites occur in large numbers, antiparasitic drugs like permethrin and benzoyl benzoate may be used. Systemic antifungal therapy might be indicated in more severe cases of seborrhoeic dermatitis. Once daily dose of 200 mg orally for one week followed by a maintenance dose of once 200 mg every other day for one month. Liver toxicity has been reported, albeit it is believed to be rare. It is given in an oral formulation in the dose of 250 mg once daily for 4 to 6 weeks. It might be associated with a low risk of tachycardia and insomnia. Borda LJ, Wikramanayake TC. Seborrheic Dermatitis and Dandruff: A Comprehensive Review. Journal of clinical and investigative dermatology. 2015;3(2):10.13188/2373-1044.1000019.